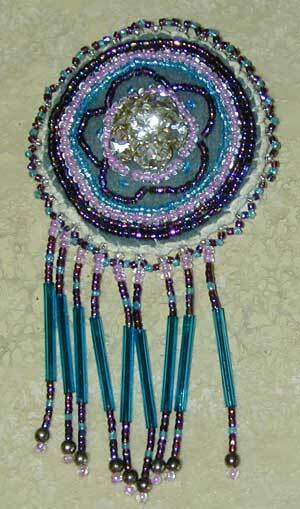 This beautiful beaded button ornament is sure to make a much used accessory for your wardrobe. Beaded by Native American Indian artist, Melinda McCloud, this piece is one of a kind. A large multi rhinestone center is accentuated with handstitched beads and beaded fringe. In the Native American tradition, the piece is backed with a smoked piece of buckskin. Measures approximately 4 inches long by 3 inches wide. Order your beaded button ornament today. It's one of a kind.